Silly me...I didn't stop to realize how hot it would be in my car when I left four tomatoes in a bag in my car in 100 degree weather outside. By the end of the day when I returned to my car I literally had stewed tomato soup! 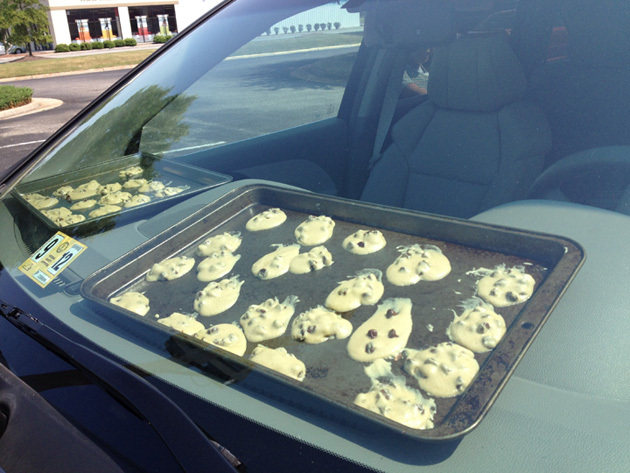 Lol...love your cookie idea! What a great idea! You can do your cooking or baking while running errands. Ooh, the possibilities for this multi-tasker! But I'll have to make it one long errand so I don't have to go in/out with AC like you, right? Half baked cookies are delicious! This is so funny! I'm totally trying it! I'll have to let my car sit in the sun and heat up first.